Travel from St. Pancras Train Station to your London City Hotel. Transfer services are available 24 hours a day, 7 days a week. When making a booking, you will need to advise your Eurostar details and your London City Hotel details. Your transfer will be confirmed instantaneously and you will be provided with a travel voucher to present to the driver. It's that easy! Driver was waiting for us as we arrived, and we had a stress free arrival into London - highly recommend the service! Convenient and easy transfer from St. Pancras to our hotel. Will definitely use this service again. Chauffeur on time. 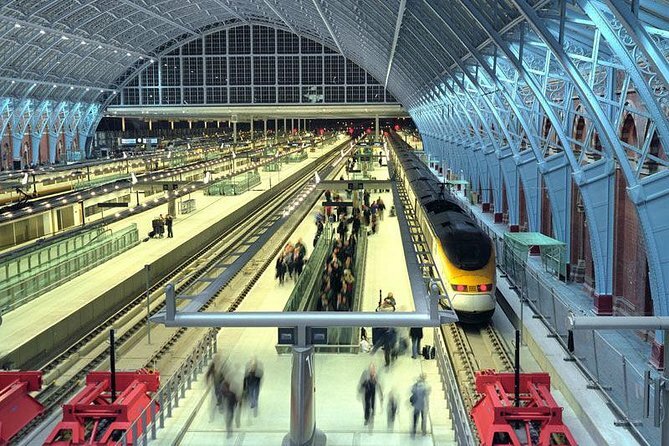 We called the agency upon arrival and coordinated the meeting point at the arrivals exit for Eurostar trains. Great service whether he spoke English or not. On time arrival. New van, clean. Courteous driver who took care of the luggage for us. Can not ask for better service. Our Eastern European driver got us to our hotel quickly during the evening rush hour. Our train was delayed, but the driver was still there waiting with our name on a sign. We had to follow him through a very busy terminal with our luggage at a very fast pace. It was as if he was in a hurry and forgot that we were both trying to manage two suitcases each as we followed him through an unfamiliar area. It was nice to have this booked before we left the states and not stress while on vacation, but after being there, we realized there were other more cost effective options. The driver was lovely, but 25 minutes late and arrived after everyone else had already left the exit area. He said his company overbooked his day and he was on his way from Heathrow and couldn't get to us. Should have just taken a taxi, but we thought it would be more convenient. We were met by the driver Illy on time. He was courteous and friendly. What we didn't like was his driving skills. He was so fast on turns that we were thrown from one side of the seat to another if you don't hold on. He drove fast on streets as if we were on hurry going to our hotel. felt like he was on an F1 race :- I hope this will not happen to other tourists. Driver was not at agreed upon meeting spot upon arrival. First time this has ever happened to me using these kinds of services. I had to call the agency twice to connect with driver. Driver arrived 15 minutes later. He did not offer to help with luggage and was constantly on his phone with someone while walking to the parking lot. At the parking lot, he talked to me in a different language that was not English Don't know what language it was nor why he assumed I understood that language. Car was nothing impressive, looked like a family vehicle. For what I got, might as well have gotten a cab. Don't get this service or get a cab instead.